When it comes to dining out, I am hardly deprived. I eat at fine dining restaurants, fine casual restaurants, fast casual restaurants, ethnic restaurants, and everything in between. A void in my dining repertoire is barbecue restaurants. I actually get a pit in my stomach when I think about it. The invitation to dine at Myron Mixon’s Pitmaster Barbecue has me jumping for joy. Literally out of my chair. I grew up going to barbecue chains. Tony Roma’s was a family favorite. But my husband doesn’t eat meat, and picking through the menu at a barbecue restaurant to find something suitable is not his idea of a good time. Many of my regular dining companions don’t eat non-kosher meat, while others prefer restaurants with more healthy options. Woe is me. 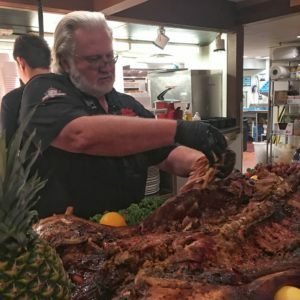 Myron Mixon is a four time barbecue world champion, a winner of more than 220 grand championships, and TV star of “BBQ Pitmasters,” “BBQ Rules,” and “Smoked.” His restaurant in Alexandria opened in fall 2016, a partnership with Joe Corey, who is a certified barbecue judge. If you are going to go whole hog and eat barbecue, this is where you do it. Myron Mixon’s appearance during my visit to the restaurant is a real treat. The legendary pitmaster resides in Unadilla, Georgia, where he is mayor. He is a larger than life character. Mixon describes butchering techniques and discusses recipes inspired by various family members, all the while tossing dripping slices of meat to our mesmerized group. He introduces us to John Bennett, who is the reigning pitmaster in the Alexandria restaurant. I am not a barbecue expert. I don’t measure brisket smoke rings, which are a visible sign of excellence, nor do I attempt to analyze regional authenticity in sauces. I’m a simpleton, who is merely eager for fine tasting food. I’m hoping that what’s on the plate in Myron Mixon’s restaurant equates to all the accolades he racks up on the competition circuit. 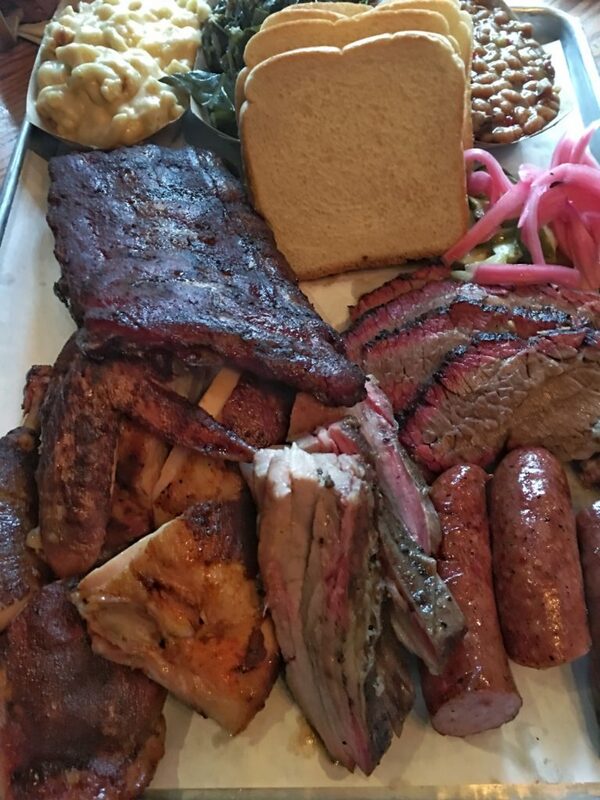 Baby back ribs, beef brisket, smoked sausage or chicken? Tough decisions like this are best conquered by a combo plate. (The plate pictured below features all the meat on the menu. Combo plates are available with a choice of two or three kinds of meat). Before the main event there are starters. 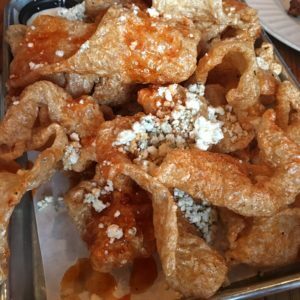 Buffalo pork rinds with blue cheese, tabasco, and honey competes alongside pimento cheese spread with Ritz crackers, barbecue deviled eggs, and my personal favorite- chicken wings with a dry rub and Alabama white sauce. Baby back ribs sprinkled with a layer of crusty spice rub nearly brings tears to my eyes. This favorite food from my youth is better than anything my memory conjures up. I gingerly apply a touch of sweet, hot, mustard bbq sauce, careful not to drown out the grill-enhanced ribs. I plan to focus my remaining attention and appetite on slices of tender Black Angus beef brisket, flavored with a mixture of apple juice and butter. I take breaks with spoonful’s of barbecue baked beans accented with peaches, tangy cole slaw, and baked potato salad studded with bacon, cheddar and chives. There’s chicken on the platter, and it’s beckoning to me. I eat chicken almost daily, so I tell myself I’ll just take a taste. But it’s the moist smoky chicken at Myron Mixon’s Pitmaster Barbecue that makes me say “whoa.” The writers at Eater DC agree with me. In a recent roundup of the hottest barbecue restaurants around DC, the chicken- with its “spicy-sweet seasoning” – is deemed what’s best on the menu here. If you finish your barbecue and feel the urge for something sweet, it’s perfectly appropriate to end the meal with a dive into a slice of praline crumb crusted key lime pie, banana pudding, or bourbon chocolate pecan pie a la mode. When you dine at Myron Mixon’s Pitmaster Barbecue, it’s imperative to leave your calorie counter at the door. If you’re not going to pig out when you eat award-winning, finger-licking, great barbecue, then really what’s the point?